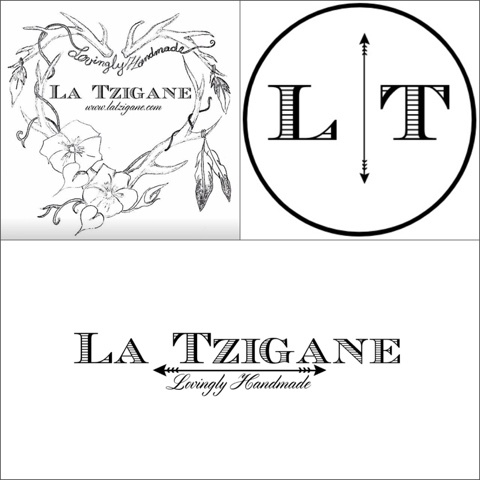 La Tzigane: Which Came First, The Goose, Or The Egg? Which Came First, The Goose, Or The Egg? 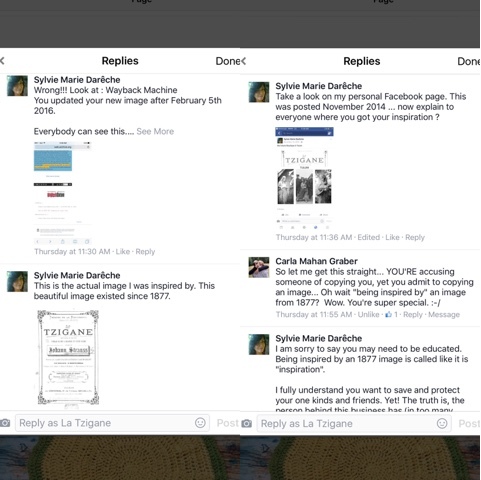 I, Julie A Harper, was accused of copying. Now, I've been called many things in my time. Artistic, Clever, Creative, Honest, Kind, Sarcastic, Supportive, but never, ever a copy cat. Like ever! 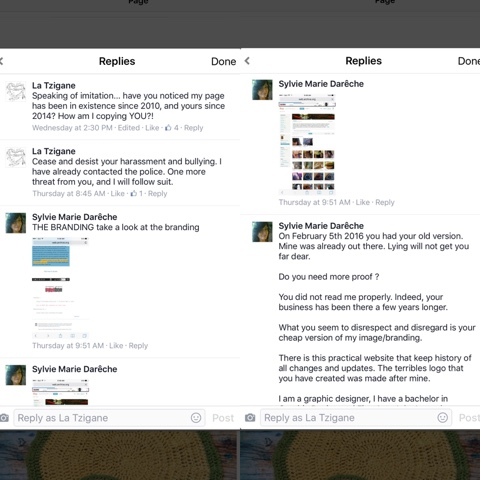 I had the pleasure of being harassed on my own facebook page by a woman who has it firmly in her head that I have usurped her 'branding'. Problem is, as hard as I might, I really don't see how I could have, because I had no clue who she was, until she started this. 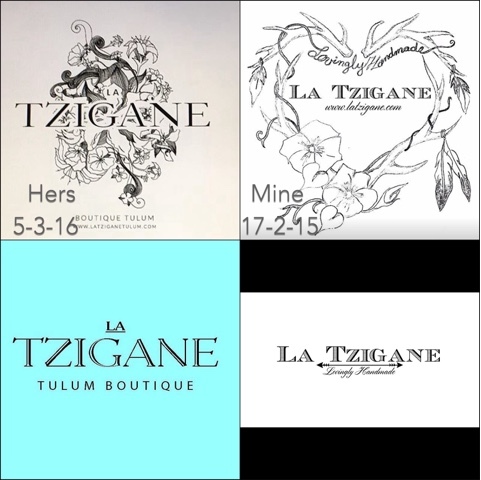 Wait, that's not entirely true, I did encounter an Instagram account about one years ago that started using my own #LaTzigane hashtag. 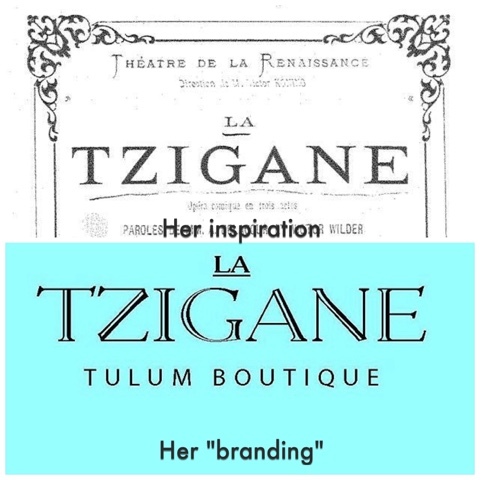 I'll admit, I was surprised at the time, because I really thought my business name was original, but La Tzigane really merely means 'The Gypsy" in old French, so I didn't make much of it. It was only a matter of time before someone else caught on. 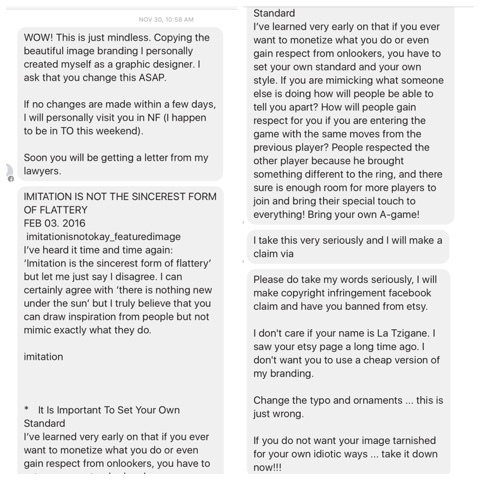 Full Disclosure: I've decided to share the whole debacle right here on my blog, why? Because I have nothing to hide! So without further ado, here is how it all started. 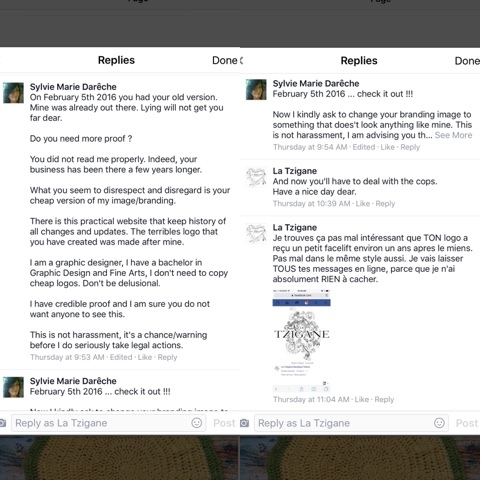 It should be noted that I have personally contacted Etsy, and was informed that Sylvie is not associated with Etsy in any way, and she does not have the ability or authority to do anything at all regarding my shop. At all. I could not even find either a personal or seller's account for her either. 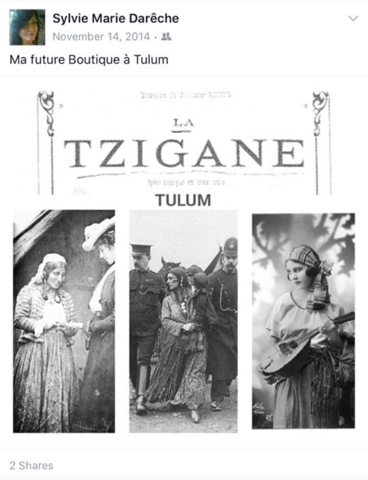 This was another screen grab she shared from her own personal page, dated November 14th, 2014, where she claims this will be her future boutique. Which, as far as I can ascertain, was at least 5 years after I opened my own facebook business page. 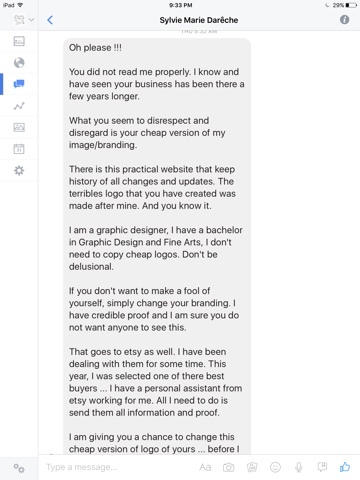 It should be noted that at this point, she hadn't even opened a business page yet, and since I did not know her, there is no way I could have just surfed her page and "stolen her idea". Now, correct me if I'm wrong, but, simply cropping a small part of an image, and using as your own, is not only NOT inspiration, it is, in fact, stealing. And yes, I know that the copyright laws only cover items up to 100 years, but it still did not fall under the rule of inspiration. In her mind though, it did. Now, I will share exactly what inspired my designs. At the end of 2014, I had been thinking about changing my branding, and started doodling some ideas, by hand, in a sketch book. Yup, I kicked it back old school! ;) And then I noticed through my IG feed that there was a sudden uptick of deer antlers floating by in all manner of decor, and this really caught my eye. My whole family, Mom and Dad's side, have been hunters and gatherers. Hunting and fishing for wild meat, farming for meat, eggs, and dairy, and planting humongous gardens, for canning, preserving, and freezing. I have wonderful memories of late summer harvests En Famille, where everyone gathered together at a specific house, to harvest whatever crop had been planted that year, and all the women got together to prepare, chop, grate, peel, stew, can, bake, it was amazing. I still remember the aromas wafting out the windows from all the cooking. And the meals. Oh, the meals. We never used disposable plates or napkins. We lined up the picnic tables outside, my great aunts would lug out baskets filled with table ware, cloth napkins, and tablecloths and blankets. The cloths were spread on the tables, the blankets on the grass under the trees, and one single table held all the dishes and flatware, and the food was spread on the rest of the tables, buffet style. It was, well, magical. We didn't have cellphones or iPads to keep us entertained then. We all talked amongst ourselves, the kids played together, ran around, our swing was a board and two ropes hanging from a branch, we swam in the duck pond (and learned to remove leeches with a salt shaker), the old men played horseshoe, the ladies played old maid, or "Vitesse" (a really fun card game that I'd love to learn to play again). Yes, it was magical. But I digress. The hunting part may not have been as magical in the gathering sense, but still required a lot of family involvement. It was mostly the men, but my Mom, and at least one of my Aunts used to join them, and all of us kids were introduced to it, it was a way of life. 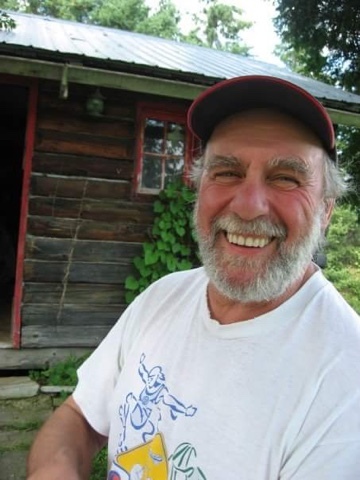 I remember my dad bringing home mallards, Canada geese, moose, deer, grouse, pheasant, beaver, racoons, rabbits, turkeys, coyote, wolves. And no, we didn't eat all of these, but most of the animal was used. Times were indeed different then. Dad's favorite hunting method has always been archery. He believed it was a noble way of hunting, that it was actual sport, where the hunter needed to be cunning and patient to catch their prey. And every year, he waited, and got that perfect trophy. 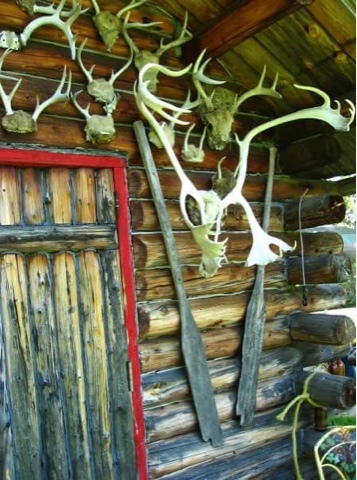 He has a wall filled with antlers to prove it. And these animals fed our family for months. I'm 44 now, and haven't lived at home for many years, but Dad likes to bestow Nature's gifts upon me on occasion, because he knows I appreciate and love them. I revere them not only because they come from him, but because they are made of Her, The Great Mother, who just as she provides Nature and greenery for her animal children, provides the same Nature, greenery, and animals for our own sustenance. 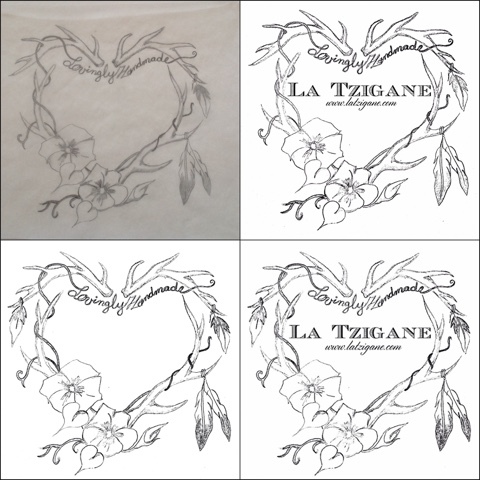 La Tzigane is Olde French for "The Gypsy", a moniker given to me by my maternal grandmother, who called me her 'petite gitane', or her 'petite bohemienne', for my wild and carefree heart. I was different. I was me. And she recognized it. And she loved me. As a child I was always dancing, whirling around, I'd twirl my skirt, wrap my head in scarves, sneak into my Nana's bedroom, and try on her special jewelry, admiring how the stones shone when the light hit them. This is where my business name came from, and the styling was reminiscent of those turn of the century dancers, Ysadora Duncan, and Ruth St. Denis, the Mothers of Modern Dance. I actually styled some of my original shots from old photos of Ruth. I didn't copy them, mind you. Just used them as inspiration. Here are a two photos I posted on my FB page a few years back, to show then where my inspiration was born from. 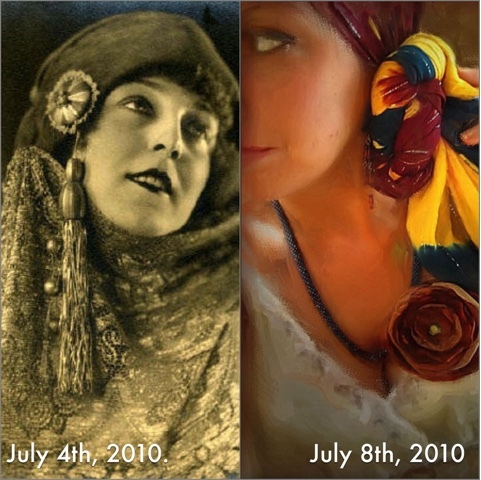 The one on the left is of Ruth St Denis, the one on the right, yours truly! While pregnant with my son, I put my etsy sop in vacation mode, and figured this would be a good time to give it a new look. It became incredibly important to me to implement my History into my logo. And I had to somehow incorporate the antlers. I had a few pairs here, and started arranging them like frames on my table. Round, oval, just two together, then, I suddenly noticed that if I took this large pair, and placed them upside down above that smaller pair, Oh my goodness, "IS THAT A HEART?!" Yes, I could definitely see a heart shape there! And how perfect was it that a heart, the greatest symbol of Love, could be formed simply by placing 4 deer antlers together. The rest then just started falling into place. All these ideas started rolling in my head, what other natural items could be incorporated as symbols of my history? Feathers? Flowers? Leaves? I scoured photos in my own family albums for things that would bring back childhood memories. I remembered walks in my grandmother's garden, on beaches, in fields and forests. And I remembered what a little collector I was, bringing home rocks, shells, sticks, flowers and leaves to press, bugs, bones and feathers to display, and this is who I still am to this day. I literally have vases designated for my feathery finds displayed in my home. My mind hummed with ideas, I scribbled, I erased, I crumpled, I started over with something different. And then it all suddenly fit. 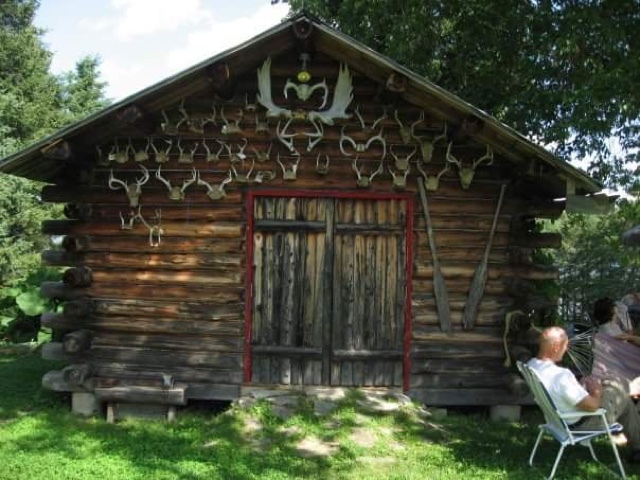 The antlers, in the shape of a heart, would represent not only my history, but my family frame. The morning glories on the bottom, which my father grows every year, two beautiful blooms which represent my husband and myself, in constant state of budding, blossoming, closing, evolving, their vines intertwined with the antlers, holding them together. The feathers, our children. Not only ours together, but my son from a previous relationship, who passed away just shy of his third birthday. He's a little to the side, in the upper corner, as a symbol of his ascendance. That is the deep representation of my logo. My Story. My History. 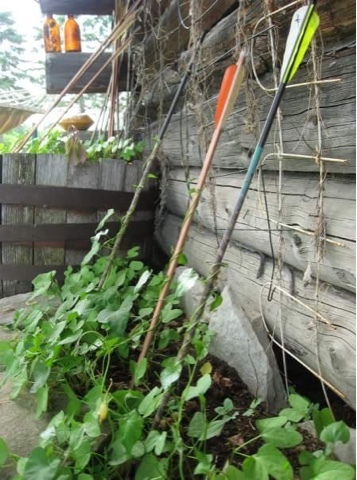 Dad's morning glories, winding themselves around old discarded practice arrows he likes to keep around. A nod to where I got my magpie tendencies I suppose. The rest, well, as far as branding goes, it all has to be cohesive, doesn't it? You can't just throw myriad images together willy-nilly and hope for the best, it has to all tie in together. And as Mr. Thompson used to tell us in Computer Graphic Design class, "KISS", as in, Keep It Simple Sweetheart (only he never said sweetheart! LOL!). So I just broke down my own logo, and found ways to tie it all together, starting with the font, and added that little arrow as a nod to my story above, and because I thought it was cute. And to be honest, to have some person harass and bully me to change what came from my heart, and accuse me of copying them, and calling my work '"cheap", and myself "delusional" (hello pot, have you met kettle? ), was downright classless! 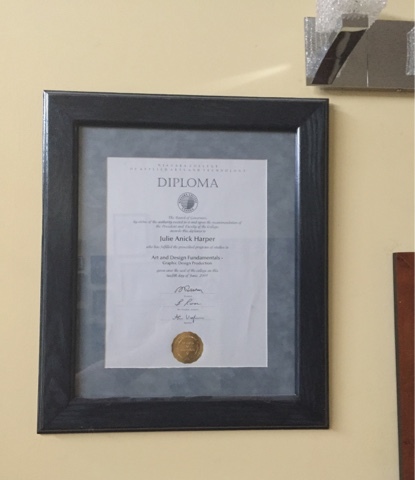 I mean, clearly, I'm clever and talented enough to execute my own beaded jewelry, crochet and knit wares -every single item in my shop right now was made of my own two hands, NOTHING is outsourced, I excelled at life drawing and graphic design, and graduated with a diploma in Visual Arts and Graphic Design from the NCAAT, but I can't be creative bough to come up with my own branding? Not to mention that I come from a long line of creatives. Oil painting, millinery, sewing, crochet, knitting, whittling, pottery, sculpting, wood turning, sketching, music, I was exposed to it all firsthand. The generation before mine believed that if you couldn't purchase it, you made it, and this was definitely passed on to me. I mean, I suppose it would be easy for someone to just judge me by their own actions, and think that everyone is just like them. If SHE simply cropped an image to suit her needs and pass it off as her own, it's definitely possible she thought I did the same. In fact, I'm pretty sure she does. But I didn't, for the simple fact that I never needed to. This is her website's home page, which doesn't lead anywhere. 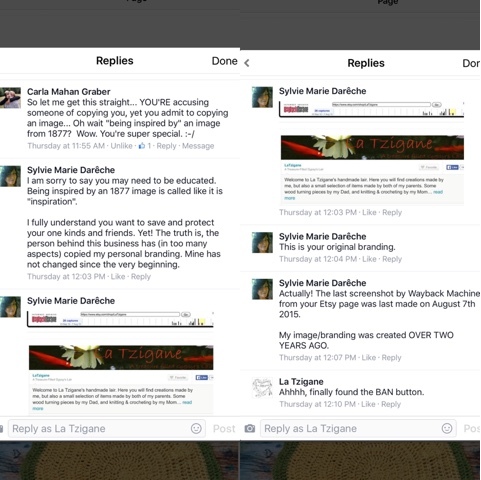 Her Facebook page was started in January 2016. Whereas mine is from 2009.